Today I'm launching a new post theme for Go Retro: A Song's Story. We'll take a look at some songs from music history that have an interesting history behind them. 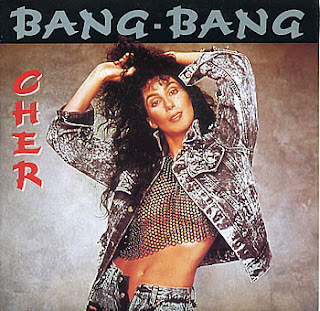 The reason for my first choice, "Bang Bang (My Baby Shot Me Down," is because I have a confession about it: until yesterday, I never knew that Cher was the original artist to sing the song and that Sonny Bono wrote it! Hard to believe, but I always thought Nancy Sinatra took the credit. Quentin Tarantino is responsible for my personal gaffe--like most people of my generation, the first time I heard it was during the opening credits of Kill Bill Volume 1. After the film was released, its exposure inspired a lot of bands and singers to cover it--most notably was "Shot You Down" by Audio Bullys who sampled the Sinatra version in what became a top ten UK hit. However, after hearing Cher's original version which was released in 1966, I'm sold on it and prefer it over Sinatra's. I'm puzzled that I've never heard it on the radio, not even on oldies stations. It's already a haunting, depressing song--the singer is telling about her love who used to play with her when they were children and would pretend to shoot her while they rode on "horses made of sticks." They grow up and she marries him--complete with dancing and church bells--but then he leaves her. She's been shot down again yet again by the creep and it's devastating. But there's something about Cher's version that literally gave me chills as I listened to it twice--first of all, it has a Western/Spanish/gypsy theme running through it. No doubt Bono was inspired by the spaghetti westerns that were gracing movie screens in the mid-60s. It also seems to foreshadow the ultimate demise of Sonny and Cher's marriage in the 70s. 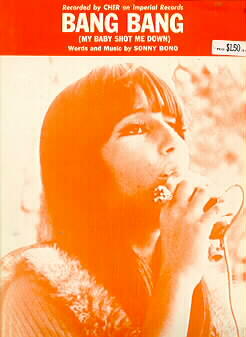 The song was released as a single and on the Cher album The Sonny Side of Cher. It reached number two on the U.S. Billboard chart in 1966. Sinatra's version was released the same year and pretty much hid in obscurity until it was chosen for the Tarantino movie. It has a more melancholy tone and an opening tremolo guitar effect. One cover of the song that I came across the other day and love is this version by a Polish singer named Ania Dabrowska. It was released in 2010 and features some pro drumming as well as a scorching sax solo--this right after I posted about how you don't hear saxophones so much in pop music anymore. And there you have it. The song will no doubt shoot me down for many more years to come. Wow Pam, very interesting backstory! I saw this title & thought "oh good, a Nancy Sinatra piece", the Cher story really took me by surprise--what a great idea for your retro blog! Thanks Doug and HermanTurnip! The fact that Cher was the original artist really was a surprise to me, too. Love that song! But to correct you..the song is about how he left her at the altar.."just for me the churchbells rang". He never showed up .. It is interesting to know different perceptions of the story. For me she's always loved her childhood's playmate but he got married with someone else, so in the church people were happy and were singing but for her that was mourning and just for her church's bell rang. Thanks, Tim! Much appreciated...and more posts coming soon.